Welcome to the first of our Clinical Forums that will take place each term for a period of 3 weeks. All Sing & Grow staff (full-time, part-time or casual) currently conducting clinical work are expected to participate in every forum by contributing their thoughts, further questions and experiences in response to the topic nominated for the term. All staff will also have a turn at facilitating the forum on a topic of choice for a 3 week period. A friendly reminder if you haven't yet sent your topic through, please do so ASAP :) We do hope this will be a valuable professional development opportunity where all staff will feel safe, respected and inspired for what they both read and write and we invite your feedback on how you find the process online. Please discuss your experience with your relevant State Manager. So without further ado, I introduce our first topic: Creating a safe and focussed space for Sing & Grow families. 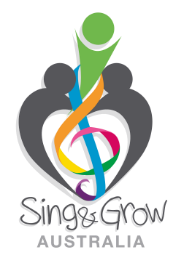 Discussions over many years have highlighted a general consensus that the most successful Sing & Grow programs are those where the parents are committed entirely to their child for the duration of sessions. When parents are willing to set aside mobile phones, adult conversations, smoking and often their own exhaustion to just be 'present' with their child for the 45 mins (approx.) of music, the benefits are much more likely to be experienced by both parent AND child. It could be suggested however, that some of these other 'distractions' may be engaged either consciously or even unconsciously by parents as a way of escaping the intimidation or attention they experience being in an unfamiliar group setting, interacting in a 'foreign' way with their child. But how do we effectively create a safe space for families where that intimidation or unwanted attention isn't so overwhelming? And how do we invite them to be 'present' and focussed in a non-authoritative fashion to ensure any existing rapport isn't lost? Please reflect on your own clinical experiences and take some time to share your strategies and thoughts for creating a safe and focussed space for Sing & Grow families. This forum will be open until Friday 29th November.